The world is an infinite rectangular array of cells, each of which can be in one of two states: alive or dead; and the neighborhood of each cell is a 3×3 grid centered on the cell. Cells which are alive remain alive if and only if they have between 2 and 3 neighbors; otherwise they die. Cells which are dead become alive if they have exactly 3 neighbors; or else they stay dead. The fact that the rules for the Game of Life are so short and clear makes it a great project for initiating novice programmers. Since Life was invented by John Conway in 1970, it has distracted many amateur and recreational mathematicians, leading to the discovery of many interesting patterns. For example, Paul Chapman showed that Life is Turing complete, and so it is in principle possible to translate any computer into a set of initial conditions. As an amusing example of this concept, here is an implementation of Conway’s Game of Life in the Game of Life created by Brice Due. Another cool pattern is the famous Gemini spaceship which is a complex self replicating system, and is perhaps the first true `organism’ to be discovered in life! 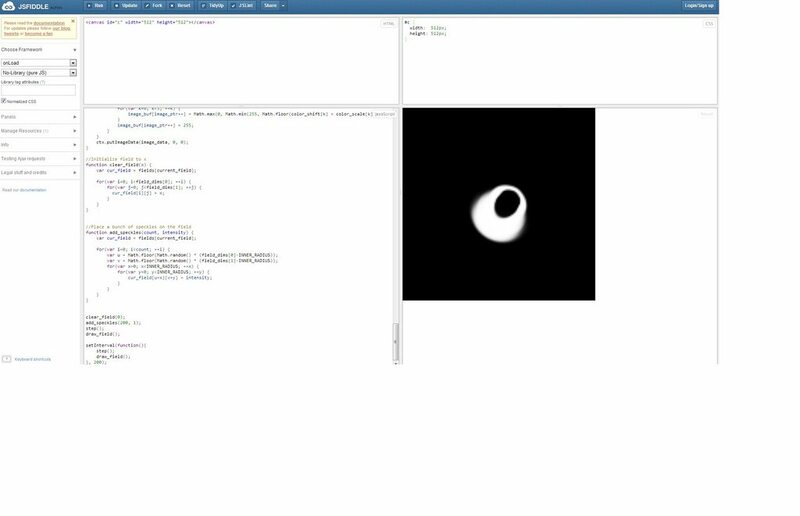 If any of this sounds interesting to you, you can play around with the Game of Life (and some other cellular automata) and look at a large and interesting library of patterns collected in the community developed Golly software package. You can read this paper for yourself, but I’ll also summarize the key concepts here. Basically, there are two main ideas in Rafler’s generalization: First, the infinite grid of cells is replaced with an `effective grid’ that is obtained by averaging over a disk. Second, the transition functions are replaced by a series of differential equations derived from a smooth interpolation of the rules for the discrete Game of Life. They are invariant under continuous shifts. They are invariant under rotations. Of course getting rid of the grid is only the first step towards a smooth version of Life. The second (and more difficult) part is that we also need to come up with a generalization of the rules for the game of life that works for continuous values. There are of course many ways to do this, and if you’ve taken a course on real analysis you may already have some idea on how to do this. However, for the sake of exposition, let’s try to follow along Rafler’s original derivation. Plot of state transition for GoL. 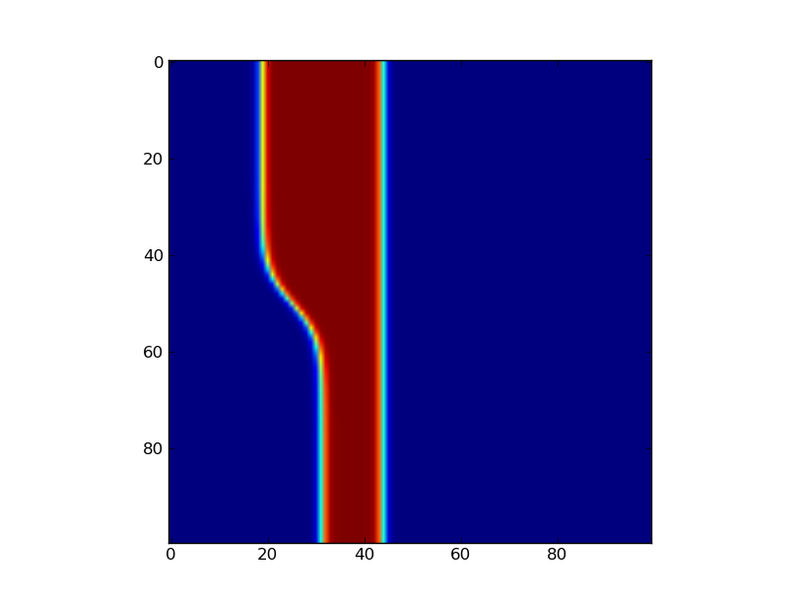 Y-axis is N, X-axis is M, red=alive, blue=dead. 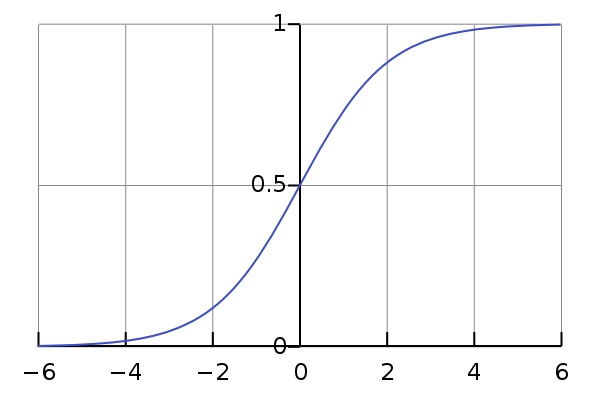 Plot of the logistic sigmoid from x = -6 to 6. Image (c) Wikipedia 2008. Author Geoff Richards. 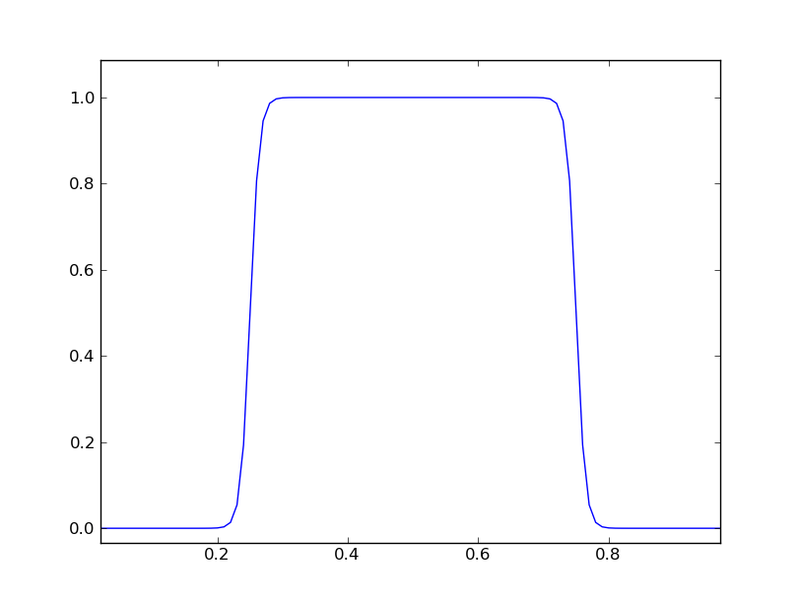 This is the transition function for SmoothLife as defined by Rafler. The squishing of this plot relative to the original plot is just a side effect of rescaling the axes to the unit interval, but even so the similarity is unmistakable. The only thing left is to pick the value of . In the original paper on SmoothLife, Rafler allows for two different values of ; for their appearance in respectively. Along with the bounds for the the life/death intervals , there are 6 total parameters to choose from in building a cellular automaton for SmoothLife. The undetermined weights are the degrees of freedom we use to represent . For example, we could represent f as a polynomial series expansion, in which case and the weights would just be the coefficients, . But there is no reason to stop at polynomials, we could approximate f by whatever functions we find convenient (and later on we’ll discuss a few reasonable choices.) What does this buy us? Well if we use a finite number of basis elements, , then we can represent our field f as a finite collection of numbers ! Cool! So, how do we use this in our simulation? and so all we have to do to compute the next state is integrate S(N,M) against each . A similar derivation applies for the smooth time stepping rules as well (modulo a small technical condition of that they must be differentiable). This means that we can parameterize the state of the infinite grid by just describing what happens within the region . This square is compact and so we have at least some hope of being able to approximate a periodic f by some finite number of functions covering this square. Finally, we come to the point where we must pick a basis in order to go any further. There is some level at which the particular choice of representative functions is arbitrary and so one could reasonably justify almost any decision. For example, I could use B-splines, polynomials, sine waves, fractals or whatever I felt like (at least as long as I can integrate it to compute N and M). What I am going to describe here is by no means the only way to proceed. For example, in his paper Rafler uses a very simple bilinear expansion in terms of quadrilateral elements to get a decent discretization. (And if you want the details scroll up and read his write up). I’ll leave it as an exercise to work out the update rules for the continuous time steps. You can run either of them in your browser and try changing the parameters. The stuff in this article is basically background material, and most of it can be found in Rafler’s paper or is already more-or-less documented in the source code for the SmoothLife project on SourceForge. However, in the sequel I plan to go a bit farther than the basic rules for SmoothLife and tell you how to make a version of SmoothLife for curved surfaces! This entry was posted in Game of Life, Mathematics, Programming and tagged game of life, smooth life, surfaces. Bookmark the permalink. Fantastic explanation. Can’t wait to see the description for curved surfaces. Will you work on a coordinate-free representation of a mesh, or on an explicit embedding? Coordinate free. 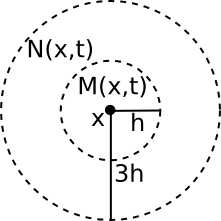 Technically the only thing we need is a Riemannian metric to compute the effective fields M and N. The basic generalization is actually quite simple (if you know a bit of geometry anyway), but the difficult part is actually discretizing and implementing it correctly. I was originally planning on covering the whole thing in one post, but it got a bit long and I decided to break it into two parts. For a while I have thought of using it as a replacement for the conventional Life glider as a symbol for hackerdom (as popularized by ESR) for those who would rather not link to ESR’s page on the symbol. Great work! I especially liked your detailed explanation of the discretization process. One question though: do you know why your version doesn’t seem to exhibit the “connecting rods” that go between the blobs that are the glider equivalents? The reason it does not is that the connecting rod version uses a different time stepping scheme and parameters. The parameters I linked to are the same as those described in Rafler’s original paper, and are known to produce gliders/solitons.